The Amazon Echo is primarily a smart home hub, but you can get use out of it for several different scenarios. Maybe you want to make the Echo your music hub, or love the new calling and messaging feature. Did you know that your Echo can also order products from Amazon with just your voice? It’s a convenient option, but carries some important concerns too. If you haven’t tried shopping with Alexa yet, let’s take a look at what you need to know before diving in. Ordering items on Amazon using an Echo is a breeze. You’ll need a compatible Echo device Amazon Echo vs. Dot vs. Tap: What Are the Key Differences? Amazon Echo vs. Dot vs. Tap: What Are the Key Differences? One common complaint against Amazon Echo was that it had too many features and cost too much. Amazon's response to that? Releasing two variations with smaller price tags: the Tap and the Echo Dot. 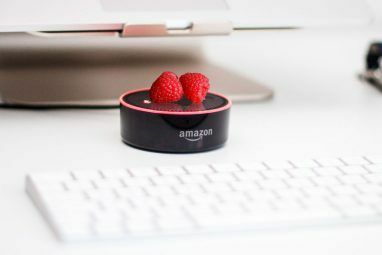 Read More — the Echo, Echo Tap, and Echo Dot are all suitable as of this writing. The new Fire TV and Fire Tablets with Alexa support will also work. 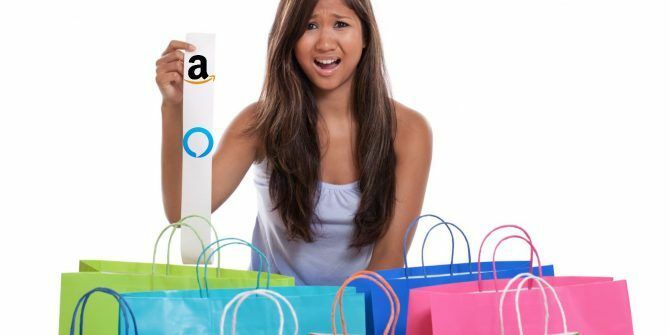 The only other requirements for ordering are that you join Amazon Prime (with its dozens of benefits 7 New Amazon Prime Benefits You Didn't Know About 7 New Amazon Prime Benefits You Didn't Know About You don't need Prime to benefit from Amazon. But Amazon Prime comes with a few lesser known benefits you may not have tried yet. Read More ) and have 1-Click ordering enabled on your account. 1-Click ordering adds a button on every Amazon item page that lets you skip your shopping cart and checkout process. It instantly charges your default card and sets the item to ship to your default address. You can manage these settings by visiting your Amazon Account page and clicking 1-Click settings. Whenever you want to order something, simply say “Alexa, order paper towels.” If you’ve ordered something matching that description in the past, Alexa will pull that item from your order history. For first-time orders, Alexa will pull the highest-rated product matching your query and offer to purchase that. Confirm that you want to order the item at the given cost (Alexa will only order Prime-eligible items, but the price includes tax). You’ll also find Alexa-only deals which you can access by asking “Alexa, what are your deals?” These change regularly and offer exclusive savings. Each account can only order one of these exclusive discount items per Echo device. For normal purchases, you can order multiple units (“Alexa, order two copies of Overwatch“) but you can’t order two different items in one voice transaction. You can take a look at the Alexa Voice Shopping homepage for daily deals and more information. Now that you know how easy it is to shop with your Echo, let’s take a look at what could go wrong. 1-Click ordering, especially with Alexa, is convenient. Of course, Amazon is the best at inventing new ways to make it easier for you to spend money on Amazon. So it’s not hard to see how this could be abused with your Echo. If a prankster guest wanted to have some fun, they could say “Alexa, order a copy of The 2009-2014 Outlook for Wood Toilet Seats in Greater China.” Now, despite your guest’s excellent taste in literature, you probably wouldn’t appreciate a $470 book charged to your account. It’s not just pranksters, though. Your child might figure out Raising Smart Kids in Smart Homes: Ideas for Parents Raising Smart Kids in Smart Homes: Ideas for Parents If you've currently got a Generation Z child living under your roof, these child-centric smart home technologies can improve life for the whole family! Read More that Alexa is capable of bringing anything to the house he wants with his voice. There’s even a chance that you could accidentally order an item during normal conversation. Alexa isn’t perfect Let's Face It: Amazon Echo's Alexa Is Stupid Let's Face It: Amazon Echo's Alexa Is Stupid There's no doubt voice-controlled assistants are the future, but is Alexa the solution? Perhaps not. In this article, I'm going to argue Alexa is actually rather stupid. Read More — she might mishear you or pick up parts of a conversation in another room. Most people are far too quick to share lots of personal information with the likes of Google, Microsoft, and Amazon. It’s amazing how much Amazon knows about you just from using an account. The company can analyze your order history, wish lists, and more to build a profile on you. Those with deep privacy concerns may want to avoid shopping with Alexa (if you even have one in the first place). Simply buying products by voice instead of using the Amazon website doesn’t provide the company with a lot of additional info about you. However, if you don’t typically order household goods on Amazon, the Echo could make it easier to fall into that habit and provide Amazon with data about how often you use toilet paper, dog food, and the like. That extra information is what you give up for the convenience of ordering via voice. When you place an order on Amazon’s website or using the app, it’s easy to see exactly what you’re ordering. Confirming the right quantity, flavor, and/or edition are all important or else you could end up with the wrong item. When ordering with Alexa, it’s harder to double-check this. Are you ordering the right flavor of chips? Did you order a video game on Xbox One by accident when you have a PS4 PS4 Slim or Xbox One S: The One Question Casual Gamers Should Ask PS4 Slim or Xbox One S: The One Question Casual Gamers Should Ask The new generation of video game consoles is more affordable than ever before. Both the Sony PlayStation 4 Slim and the Microsoft Xbox One S cost around $250, both packaged with one game each. Which... Read More ? And did she hear the name brand you specified correctly? If you routinely order the same items then this won’t be as much of a concern, but for one-off and new purchases, you could end up accidentally buying the wrong good. Those who don’t have much self-control could get carried way when ordering with Alexa. Impulse buying can sap your money away without you even realizing how much you’re spending. One of the best ways to stop wasting money Stop Wasting Money in 5 Minutes or Less Stop Wasting Money in 5 Minutes or Less It's hard to keep yourself from wasting money. Here are ten things you can do five minutes or less to set yourself up for financial success. Read More is to make it harder to actually spend it. I just impulse bought a PlayStation 4 that I didn't need and now I hate myself. If you have no problem pulling out your credit card, forcing yourself to go to the ATM and use cash means you’re less likely to spend on stuff you really don’t need. It’s the same principle with the Echo — having the ability to order anything on Amazon with a few spoken sentences is powerful. Be careful if you’re prone to wild spending! Thankfully, your Echo provides controls to help mitigate some of these concerns. Here are some ways to make shopping with Alexa less stressful. The easiest way to ensure that your children or guests don’t make unwanted orders is adding a passcode to your Echo. Whenever you try to buy something, Alexa will ask you for a simple four-digit number to confirm you’re the one making the order. To add a code, open up the Alexa app on your iPhone or Android device, slide open the left menu, and tap Settings. Scroll down and tap on Voice Purchasing. Make sure Purchase by voice is enabled, then add a your code to the field below Require confirmation code. You must then say this code aloud when making an order. 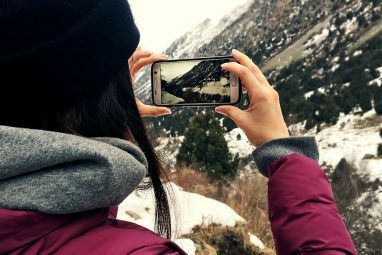 Note that your code appears in your voice history, so a tech-savvy family member could grab your phone and find the code if you don’t use lock screen protection Should You Use a Fingerprint or a PIN to Lock Your Phone? Should You Use a Fingerprint or a PIN to Lock Your Phone? Should you secure your phone with a fingerprint or a PIN? No one is likely to guess your fingerprint, but is it really more secure? Could a PIN be more secure? Read More . Whenever you order something on Amazon, you have about 30 minutes to cancel after ordering. If you accidentally order the wrong item using your Echo, you can say “Alexa, cancel my order” to call it back. Should your Echo be unable to do this, you can visit the My Orders page on Amazon, find your recent order, and click the Cancel button to stop it. Make sure to do this quickly, else the allotted time might pass. If you don’t cancel the order in time, you can visit the Amazon Returns Center to get set up with a free return The Best Amazon Customer Service Tips That Make You a Better Shopper The Best Amazon Customer Service Tips That Make You a Better Shopper We've all heard horror stories about customer service gone wrong, but with these Amazon tips and tricks your next shopping experience can be a positive one! Read More . Any physical goods you order with Alexa come with free returns. Maybe you want to wait before committing to a purchase, or want to review Alexa’s findings to avoid ordering the wrong quantity or edition. You can do this by adding items to your cart instead of Alexa ordering them for you. Just say “Alexa, add a Logitech MX Master mouse to my cart” and you’ll instantly see it when you check your cart on Amazon’s website or mobile app. From there, you can fine-tune it and wait to make sure you aren’t impulsively buying anything. If you don’t want to bother with Echo purchasing at all, you can remove the feature entirely. Open the Alexa app, slide open the left menu, and tap Settings. Scroll down and click Voice Purchasing. Here, you can disable the slider to prevent purchases by voice. This fixes all the problems above! Don’t Forget the New Dash Wand! Shopping with your Echo is great, but there’s an all-new way to order from Amazon available now. The new Amazon Dash Wand is one of the coolest smart home devices of 2017 The 10 Best Internet of Things Gadgets You Must Try The 10 Best Internet of Things Gadgets You Must Try Just a decade ago, gadgets like these were the stuff of imagination. But now, Internet-connected toys, headphones, luggage and more are widely available. Here are some amazing products you should definitely check out! Read More . It’s a Wi-Fi enabled assistant that lets you instantly order household items from Amazon. Just scan the barcode of an item in your house or say “Alexa, paper plates” to add them to your Amazon cart. The Dash Wand even supports the big library of Alexa skills 18 Awesome New Amazon Alexa Skills You Need to Try 18 Awesome New Amazon Alexa Skills You Need to Try The Amazon Echo's list of skills is growing all the time. Let's take a look at the most useful and silliest skills from the past few months. Read More , so you can ask for the weather, get kitchen measurements, and explore what other developers have come up with. It doesn’t play music or set alarms/timers, so it’s not a complete Echo replacement. But for a low $20 price that’s refunded with a credit after you register it, it could be the best way to shop with Amazon in your home. Ready to Fill Your Cart? Now you’re ready to shop with your Amazon Echo. Don’t be afraid to try it out — having products shipped to your house with just a few words is pretty neat! But it’s important to make sure others can’t make purchases on your account first. As long as you can control your spending and don’t mind providing information to Amazon, voice shopping is a convenient option. One final tip: No matter what you’re ordering from Amazon, they may not have the cheapest price, especially on grocery items. Make sure you aren’t throwing money away by, say, ordering deodorant with your Dash Wand and paying twice the price of your local grocery store. No level of convenience is worth that! Don’t have an Echo yet? Check out our guide to finding out which one is best for you A Comparison Guide to Amazon Echo Devices: Which One Is Best for You? A Comparison Guide to Amazon Echo Devices: Which One Is Best for You? Which Amazon Echo device is right for you? We compare the Plus, Dot, Tap, Show, Spot, Look, and Fire TV Cube to help you make up your mind. Read More . 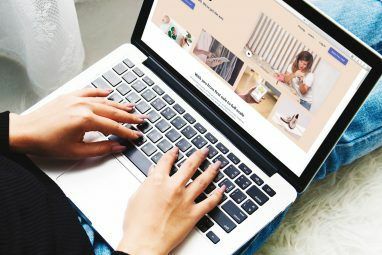 Or eschew Amazon and try an alternative instead 5 Reliable Online Shopping Alternatives to Amazon 5 Reliable Online Shopping Alternatives to Amazon Amazon is the biggest player in the game of online retailers, but that doesn't mean you have to use them. Read More ! Do you regularly purchase products with your Echo or does it make you nervous? Have you had any horror stories of orders gone wrong? Tell us your thoughts below in the comments! Explore more about: Alexa, Amazon, Amazon Echo, Amazon Prime, Online Shopping. Amazon Music Is Now Free for Amazon Echo OwnersWhat Is A Smart Doorbell, And Which Should You Buy?